Be the first to share your favorite memory, photo or story of Bridgette. This memorial page is dedicated for family, friends and future generations to celebrate the life of their loved one. 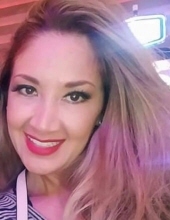 It is with great sadness that the family of Bridgette Ramirez (Juarez), age 36, announces her passing on Sunday, October, 28, 2018. Mass of Christian Burial will be 11:00 AM Friday, November 9, 2018 at St. Mary’s Cathedral in Grand Island, NE with The Reverend James Golka Celebrating. Visitation will be Thursday, November 8, 2018 from 3:30 PM – 6:30 PM at Livingston-Sondermann Funeral Chapel in Grand Island, NE. She was born to the late Juan Ramon Juarez and Maria (Rodriguez) Rayburn on April 3, 1982 in Los Angeles, California. Bridgette spent many years working for Interpreter Services at Saint Francis Medical Center before a change of career this past year. During her time at Saint Francis she enjoyed interacting with patients and medical staff while being of help to her community. She worked hard to provide for her boys. When she wasn’t working she enjoyed being with her dog Teddy, a good BBQ with her family, singing (loud), dancing, laughing, and making others laugh with her constant jokes. Bridgette will be forever lovingly remembered by her husband, friend, and love of 20 years, Jose Cruz Ramirez; children, Jose, Anthony, Brandon (Blanca Aguilar); soon to be granddaughter; mother, Maria and step-dad Eric Rayburn; sisters, Jacqueline “Jackie” (Derrick) Meier, Brenda “Bren” (Joel) Sanchez; brother, Juan (Diana) Juarez. Bridgette will forever be remembered by her many nephews and nieces, Damien Juarez, Elijah Meier, Aaron (AJ) Juarez, Ariela Meier, Estella Sanchez, Jonny Estep, Mateo Meier, and Dalian Juarez; extended family; and her dear friends. She was preceded in death by her father, Juan Ramon Juarez; grandfather, Jose Rodriguez; and cousin, Luis E. Garcia. The family requests only white and pink floral arrangements for services and formal attire. Family welcomes those who knew and loved Bridgette; as well, as those who desire to support the family during this time. Memorials are suggested to the family to be designated at a later date. Livingston-Sondermann Funeral Home is entrusted with arrangements. Online condolences and sharing of memories may be directed to www.livson.com. To send flowers or a remembrance gift to the family of Bridgette Ramirez, please visit our Tribute Store. "Email Address" would like to share the life celebration of Bridgette Ramirez. Click on the "link" to go to share a favorite memory or leave a condolence message for the family.